A century from Alex Lees helped Yorkshire close on 226/3 from 81 overs in reply to 428 all out from Nottinghamshire, on Day Two of this County Championship match at Trent Bridge. The home side lost their last three wickets relatively quickly, with Alex Hales dismissed for 236, before Lees led an impressive Yorkshire reply. The opener was supported by 41 from Will Rhodes and a 59 by Cheteshwar Pujara and though all three were dismissed, this was marginally the visitors’ day. However, the home side remain slightly ahead in the match, which appears to be set for a high-scoring draw. Notts resumed on 393/7 and swiftly attained maximum batting points, though soon afterwards Jack Brooks had Vernon Philander edging to Jack Leaning at second slip for a circumspect seven. Patterson then castled Hales for a superb 236 with an excellent ball that nipped away slightly and hit the top of the off stump, attaining figures of 3/78. 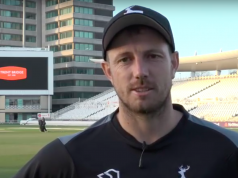 The innings was then completed when Jake Ball stepped away and missed a leg-stump Yorker from Tim Bresnan, having hit the previous ball for six. 428 all out from Notts represented a good recovery for Yorkshire considering the hosts had been 248/2, and the visitors started their reply positively too. Rhodes started with successive boundaries of Ball and later completed the same feat against Philander in racing to 39 not out before lunch. Lees was technically precise, cover-driving beautifully off Will Gidman to take the total past 50 as Yorkshire reached 620 from just 16 overs at the interval. Notts started the afternoon session well through a tight spell of bowling from Harry Gurney and Philander, with the former having Rhodes out for 41, edging to Samit Patel who took a good low catch at second slip. That brought Pujara to the crease who, in combination with Lees steadily took Yorkshire through the afternoon session and onto 140/1 at tea. Lees showed his positivity when down pitch to loft Gidman over mid-off for four to take Yorkshire past 100, and the pair looked relatively untroubled. Pujara had a let off just after tea when Riki Wessels dropped a regulation catch of Vernon Philander, allowing the Indian international and Lees to press on in steady, though unspectacular fashion. The hundred partnership came up of 239 balls, reflecting that the pair were in no hurry, whilst looking comfortable in bright sunshine that made for good batting conditions. Pujara brought up his first Yorkshire fifty, coming from 117 balls, though he departed soon afterwards 57. The dismissal came from trying to pull a Samit Patel delivery that was too full for this, with substitute fielder Ben Kitt catching impressively. Lees continued on, reaching a defiant century from 223 balls, though on exactly 100 he was dismissed caught behind off Gidman, who claimed his first ever wicket for the home side. 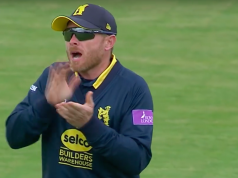 As Notts applied pressure visiting skipper Andrew Gale batted solidly to reach 13 from 50 balls before the close, with Jack Leaning reaching three not out from 26 deliveries alongside him.